Despite a weather forecast promising overcast skies, there’s barely a wisp of cloud and we’re already 22° C. As the work today is largely heavy (hoeing, moving spoilheaps, clearing vegetation etc. ), people will need to be careful to use sunblock and drink plenty of water. The weathering of the exposed surface in Trench IV makes it clear that we do indeed have a ditch on this side. There are also distinct bands visible inside the bank, allowing an assessment to be made of its construction. By lunchtime, all of Tr IV has been cleaned, the vegetation around both trenches removed, the spoilheaps cleared back and work started on taking the backfill off the geotextile. Better progress than I’d hoped in this heat and humidity! I’ve redone the matrix for last year’s Tr I and found that I’d missed assigning a context to a chalk deposit seen in section. All done now, so we’re ready to start assigning contexts to Tr IV. There’s a lot of dust on the surface of the bank, so it will need to be brushed carefully. That way, we ought to be able to distinguish between the separate dump horizons. 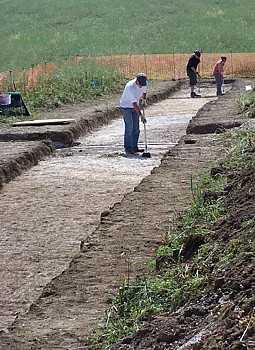 Posted on 28 July 2011, in Fieldwork, Stapleton's Field Dig 2011. Bookmark the permalink. Leave a comment.